FBI Director James Comey confirmed on Monday that the FBI is actively investigating ties between Trump's campaign and Russia. He also shot down the ridiculous wiretap allegations Trump made to distract us all from his ties to Russia. We also know that Attorney General Jeff Sessions lied under oath about his contact with Russian officials during Trump's campaign. Sessions has recused himself from leading the investigation into Trump's ties to Russia, passing that responsibility on to Acting Deputy Attorney General Dana Boente (apparently, it's pronounced BEN-tay). But that is nowhere near enough. WE NEED AN INDEPENDENT SPECIAL PROSECUTOR TO ENSURE A FULL, FAIR INVESTIGATION. "Hi, my name is ___ and I'm calling from ___ to urge Deputy AG Boente (BEN-tay) to appoint a special prosecutor to investigate Attorney General Session's possible perjury as well as Russia's interference in the 2016 elections and President Trump's possible collusion. These are obviously hugely sensitive issues of national security that require a thorough, impartial investigation that is not tainted by association with Sessions. Thank you so much for taking the time to listen." 2. Submit a comment through the AG's office's web site. You're welcome to copy my comment below or write your own. In terms of topic, I chose "Messages to the Deputy Attorney General." 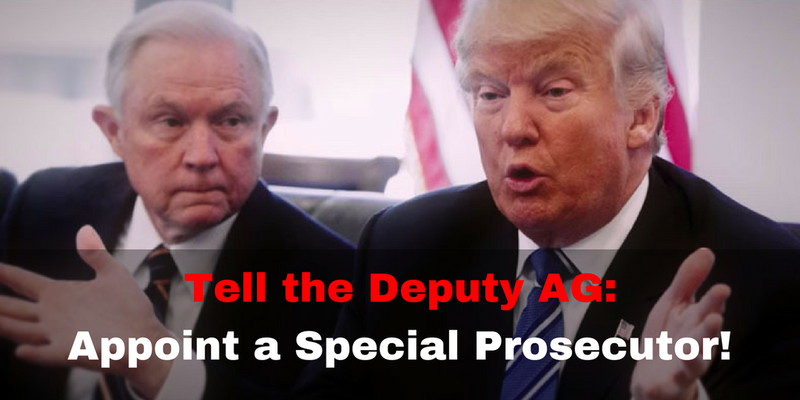 "I'm writing to urge you to appoint a special prosecutor to investigate President Trump's ties to Russia and possible collusion in their successful attempts to influence our 2016 elections as well as to investigate Attorney General Jeff Session's ties to Russia and his lies under oath about his contacts with the Russians during Donald Trump's campaign. Given that AG Sessions has admitted to lying under oath, I do not feel that merely recusing himself will be enough to ensure a truly free and impartial investigation. We need an independent investigator who can perform a thorough, unbiased investigation into these deeply troubling questions. Thank you for your time and attention to this truly urgent matter of national security." 4. Share this action with three friends via email or social media. Then go about your business.